Are you looking for great hand tools like Janice? Perhaps you’re just trying to replace some you already have. It’s important to realize that new hand tools appear in the marketplace each and every year. Keeping up with each and every release is a full-time job! I have to admit it’s often hard to wow me when it comes to a new tool, but every now and then magic happens. Just two weeks ago two new tape measures put my head on a swivel. One would think it’s impossible to significantly improve a standard steel retractable tape measure. Think again. This new tape measure had a blade hook that was coated on both sides with fine diamond grit. Every other tape I’ve owned had a shiny chrome hook that would slip off things you were trying to measure. The tape also had extra reinforcement ribs to protect it in case you drop it. Finally, it came with a hole in the lower left corner that allows you to transform it into a tool that will help you draw circles or ovals. It’s the new Lufkin Shockforce tape. Screwdrivers are a must. I happen to gravitate to the screwdrivers that contain six or seven bits in the handle. This way you have multiple screwdrivers with assorted bits all in one tool. The screwdrivers like this that cost more money are usually the ones that perform best and will have the most comfortable fit in your hand. Everyone needs a hammer, but most homeowners don’t realize they come in different weights. You need to match the hammer to the job. A 16-ounce hammer is probably the most common, but I typically use a 20-ounce one. The heavier the hammer the fewer blows are required to get the job done. Drywall repair tools can be handy as it always seems a wall or ceiling requires some work. I discovered long ago it really pays to invest the extra money for stainless steel taping and broad knives. You can also get stainless steel mud pans. These tools, if cared for, will last for generations. Tool storage should be high on your list. You want a nice box where you can store most of your tools so they’re protected and you know where to find them. Newer plastic boxes are a vast improvement over the old heavy steel boxes that would undoubtedly start to rust. The white pipes sticking up out of the concrete floor are in the wrong location. It’s never any fun to deliver tough-love answers. This happens to be one of those occasions. Let’s first discuss the concrete slab stability issue. I would never rip out the entire slab. It’s an unreasonable request. 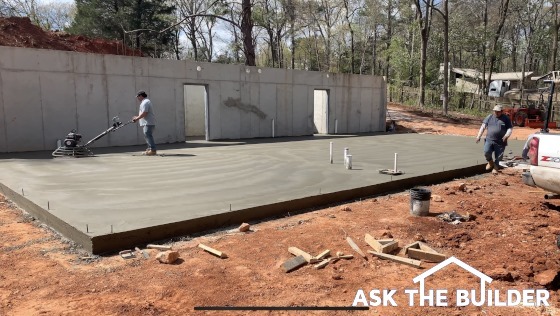 The concrete slab can be cut all the way through with a large diamond wet saw that contractors often use to cut into roadways or other large slabs. Once you make all the cut lines to create the space needed to relocate the pipes to the correct location, you jackhammer out the concrete between the cut lines. Because the saw cut all the way through the slab, the concrete that’s away from the pipes will not be affected by the pounding of the jackhammer. After the new plumbing pipes are in and the fill material is compacted it’s time to pour the replacement concrete. I’d drill into the sides of the original slab with a 1/2-inch rotary hammer drill every 16 inches along the cut lines of the slab. Drill 3 or 4 inches deep and tap into the holes 8-inch-long pieces of 1/2-inch rebar. These pins will help lock the new concrete to the original pour. A great finisher can easily match the top surface of the concrete so it’s in the same plane as the original slab. Now for the tough love. Chris bears 50% of the responsibility of the mistake. Yes, the plumber read the plans upside down, but Chris should have inspected the location of the pipes before the concrete was on its way to the job site. You can’t hope things are done right. Every aspect of the work done by the subcontractors needs to be checked by the builder before it’s covered up by something else.